When Detective Constable Connie Childs is dragged from her bed to the fire-wrecked property on Cross Farm Lane she knows as she steps from the car that this house contains death. Three bodies discovered – a family obliterated – their deaths all seem to point to one conclusion: One mother, one murderer. But D.C. Childs, determined as ever to discover the truth behind the tragedy, realises it is the fourth body – the one they cannot find – that holds the key to the mystery at Cross Farm Lane. What Connie Childs fails to spot is that her determination to unmask the real murderer might cost her more than her health – this time she could lose the thing she cares about most: her career. I met Sarah at an author event last year along with Michael Wood and the late Helen Cadbury. Sarah asked if I would like to take part in the blog tour for her last book ‘A Deadly Thaw’. I couldn’t believe that an author had asked little old me to take part. Sarah is lovely and I thoroughly enjoyed reading ‘A Deadly Thaw’. I was over the moon when I was asked if I would like to take part in the blog tour for ‘A Patient Fury’ and even did a little happy dance, which wasn’t pretty. I was not to be disappointed. In fact I enjoyed it just as much as ‘A Deadly Thaw’ if not more so but more about that in a bit. I don’t really want to type too much about the storyline as I have a nasty, but completely unintentional, habit of giving away far too many spoilers about books I have enjoyed. DC Connie Childs and DI Francis Sadler are dragged from their beds to the scene of a house fire in a local road, Cross Farm Lane. The fire is ferocious in its intensity and sadly three bodies are discovered and then recovered from the scene. The bodies are those of two adults and a child. There is something suspicious about the fire and about who set the fire. The fire brigade investigator speculates that the fire was started deliberately and that one adult (the mother) murdered the child and the other adult (the father) before then committing suicide. However, there is still something that doesn’t feel quite right and DC Childs is determined to get to the truth. It soon emerges that there is a fourth body that is connected with the story of the fire and DC Childs has a hunch that it is the fourth body that holds the key to the mystery of what happened at Cross Farm Lane. DC Childs is so determined to solve the case and she fails to realise that this case might not only threaten her health but it may also take away her career. Can the mystery of the fire at Cross Farm Lane be solved? Is the mother of the family the killer? Can DC Childs hold on to her career and her health? Well for the answers to those questions and more you are just going to have to read the book for yourselves. I have to say that I really felt for and took to the character of DC Connie Childs. She is clearly a woman who has clearly suffered in the past but she tries to dust herself down and carry on. She has taken up smoking again, rather than the e-cigarettes that she had been using. I think that this is her coping mechanism and one of the few things that might calm her down. Connie is a determined woman. The scene of the fire upsets her greatly and she becomes determined to do what she can to solve the mystery and to seek justice for the victims of the fire. When Connie is investigating a case, she becomes like a dog with a bone and if something doesn’t sit right, Connie beavers away to find out the truth. Connie is one strong, feisty, determined and stubborn woman and I like her a lot. ‘A Patient Fury’ is brilliantly written and it kept me guessing from start to finish. The story is told in two periods of time- one being the present and the second being flashbacks to the beginning of the 1980s. These two strands interweave seamlessly and help to tell the story in its entirety. I became seriously addicted to reading this book and it came everywhere with me. My dogs were not amused because I didn’t want to take them out as that would have eaten in to reading time. The pages were turning that quickly that it was almost as if they were turning themselves and before I knew it I had finished the book, which I was so unhappy about because I just wanted the story to continue. I really did feel part of the investigating team and I formed opinions as to who I thought was telling porkie pies. The author clearly cares about her characters and this shines through in her writing. The characters are well formed, seem human and they come alive as you read the story. I could literally imagine the action taking place in front of me and I felt as though I was watching television instead of reading a book. Reading this book was a bit like being on a rollercoaster ride with all the twists, turns, stomach churning moments and the feelings of dread and fear. At times I almost had to read through my fingers because I genuinely feared what was going to happen next. I didn’t think that it was possible that ‘A Patient Fury’ would better ‘A Deadly Thaw’ but how wrong can you be? 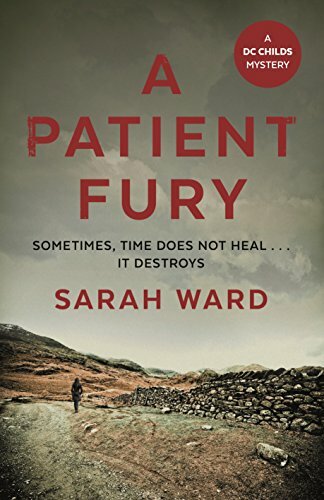 ‘A Patient Fury’ is Sarah Ward’s best book to date and this is certainly a series that gets better and better. Sarah Ward is right up there on my list of favourite and must read authors. In short, and just in case you hadn’t already realized, I totally and utterly LOVED, LOVED, LOVED reading this fantastic book and I can’t wait to read more books in the DC Connie Childs series. As I said this is one series that just keeps getting better and better and I would definitely recommend this series to anyone. I award this book an easy 5* out of 5* but I would award it many more stars if I could because I really did enjoy the book that much.